There are some restaurants that we keep coming back to, no matter how everyday the fare may seem. And usually, we order the same things, dropping by the restaurant to appease a craving for the old stand-bys. One such restaurant is Recipes by Cafe Metro. A brightly lit, modern-looking cafe, Recipes falls back on old staples of the local cuisine, mostly given an interesting twist. While I have tried and liked a lot of their dishes, two things that keep me coming back is their rendition of pritong isda (fried fish) and lechon kawali (crispy fried pork back). Recipes adds a modernist touch to the lowly fried fish with their Crispy Tilapia. 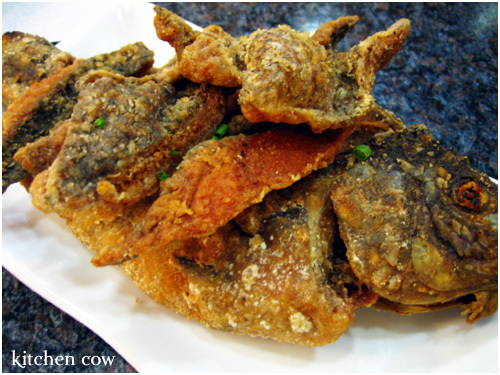 Instead of the usual fried fish which is fried whole, their version is fish sticks inspired. A whole tilapia is filleted, then cut into strips which is then floured then fried to a crisp. The fish bones and head is treated the same way and served along with the strips, adding design pizzazz as well as giving those who adore picking fish bones and fish heads clean something to munch on. Served with a soy-based dipping sauce, the Crispy Tilapia is a crispy and flavorful, retaining much of the firm, fresh fish taste while having a characteristic fried fish crunch. Their lechon kawali is equally stellar, with meaty fried pork chunks resting on a bed of kangkong (swamp cabbage), all swimming in a soy-vinegar based sauce. Unlike other restaurants that serve their lechon kawali sauce on the side, theirs is defiantly poured into the bowl, letting the flavors seep into both the pork and vegetable. Despite the sauce, the lechon kawali usually retains its crispiness, making each bite a meaty, salty-sour crunch that makes you forget any issues you have with calories and cholesterol. To serve this particular lechon kawali with a liver-based lechon (whole pig roasted on a spit) sauce would be doing it a grave injustice. 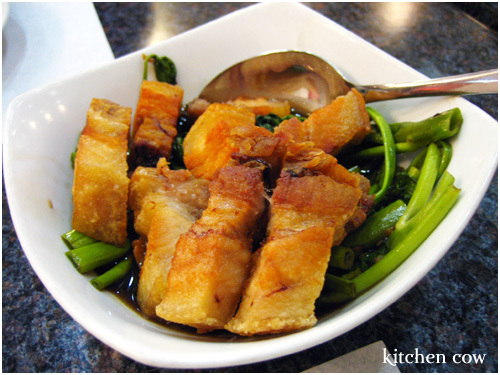 For me, the soy-vinegar sauce is the perfect foil to the fatty goodness of the pork. Served with copious amounts of steamed rice, these dishes make me let go of whatever restraint I have with eating and make me the happiest little cow ever. Ah Recipes. You could strip your menu bare and leave me with just these two dishes and I’ll still be coming back. Ah, but of course, you have to leave rice on the menu as well. I love Recipes! I don’t go there often enough, but they really have awesome Pinoy food! Grabe, sobrang addicted ako sa crispy tilapia nila! I’ve been curious about Recipe, and by golly! I’m gonna make sure we try it tonight! What do you order? Just in case I’m up to trying something different next time. I also like their adobo flakes and gising-gising, even if our gising-gising is very very different from their gising-gising. It’s probably laden with addictive substances. I swear I have to keep coming back for more. Maybe it has crack! I super love Recipes! Have you tried their gising-gising, dinuguan and crispy tadyang? Ooh la la. Nirvana. Just the gising-gising. I’m game about trying the other two dishes though. Thanks for this! I looooove tilapia. I can eat it everyday! I may have a new haunt this December when I’m in town. Is Cafe Metro new or did I just miss it in May? My family dined there last weekend and it was a ful-“filling” experience. We ordered lechon kawali and general’s chicken. I personally loved the kawali because of its crispness. My daughter and husband so loved the seafood rice.